The second half of 2016 has seen a couple of high profile hearables suffer from delays. The Apple AirPods are now finally shipping after a few months of waiting and Doppler Labs' much-anticipated (in these quarters at least) Here One smart earbuds are now pushed back to February/March 2017. Now, anyone who has crowdfunded a wearable will know this is nothing new. But hearables, smart headphones, whatever you want to call them, offer some new challenges that it seems companies big and small are struggling with. Let us break a few of the main ones down. The speculation on the internet is that it was connectivity challenges leading to the AirPods delay. Tim Cook and co are being typically cagey on specifics but it's thought that there's a core AirPod which connects to your iPhone and uses its own version of Bluetooth to connect to the second earbud. The audio has to hit each ear at (almost, almost, almost) the same time, hence the problem. Doppler Labs CEO Noah Kraft said much the same thing to Fast.Co recently, that users can hear any latency in audio data and it's better to wait rather than release an inferior product. Of course, Doppler Labs' Here Ones don't just play music from your phone, they also augment or noise cancel external sounds thanks to its microphones too - a big ask. "For us, the most challenging thing is the real world audio augmentation," Kraft told us. "With the Here One we had to make sure there was zero latency and the natural acoustics, that was the hardest thing we had to. We evolved that to adaptive filtering. That was a huge jump because we were tackling signal processing challenges that the industry have been trying to accomplish for decades." Then there's the size. 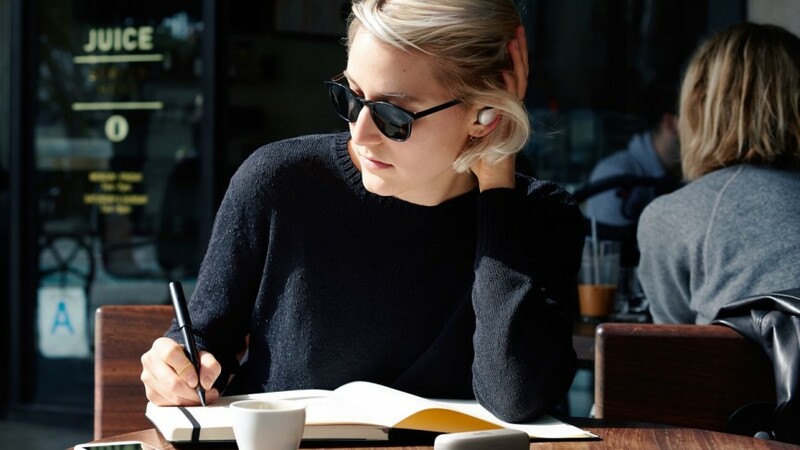 Some companies like Sony have chosen to release a single, mono earbud with its just-on-sale Xperia Ear rather than contend with handling music as well as voice interactions. And Sony knows audio. The Xperia Ear has proximity sensors, NFC and Bluetooth antennas, an LED and two microphones inside and well, doesn't stick out from the ear that much. Back to connectivity and R&D company Cambridge Consultants posted a blog on the AirPods about the way in which Apple and others could avoid "the Frankenstein look". "To give an idea of the technical challenge," explained senior consultant Arun Ventasakubramanian. "Most antennas are efficient when their size is a quarter of half the operating wavelength. At 2.4 GHz, the wavelength is about 12.5 cm so a half wave antenna is about 6 cm. This is not something you want sticking out of your ear." When executive editor James Stables had a chat with Sonny Vu recently, he asked the Fossil VP/Misfit founder about the still-not-released Misfit Specter. The fitness tracking earphones were announced at CES which is now nearly 12 months ago. Now, they may simply have been a casualty of the Fossil takeover but there's more to the story than that. "Wearables are a very difficult category to build for, and hearables are even harder," Vu told us. "There's no battery space. It's such a sensitive part of the body, so you can't be putting weird stuff there. You have to be very careful with the materials." Still despite his interest in the ear it doesn't look like we can expect a Fossil line of smart headphones anytime soon: "If anyone's building hearable hardware, I'd be like, you know, you'd be better off building a robot." With the Bragi Dash, everyone thought the hard part was actually building these two wireless earbuds that store (and play) music, accesses voice assistants and track heart rate and fitness. Turns out that once Bragi had figured out a way to stuff all these sensors into something comfortable and practical in the ear, there were more challenges ahead when the Dash was shipped to users. There was a gap between what was advertised and what the Dash could reliably do. Since the launch, which gave it a headstart over bigger players, the do-it-all hearable has consistently improved and it has now sold over 100,000 units. Big software updates include enhancing the Bluetooth connection to your smartphone, adding features like on demand heart rate readings and gesture controls plus improvements to audio in windy weather and phone call quality. Bragi told us that its core focus is improving both Bluetooth connectivity and battery life as that's what its users care about. Jarrod Jordan, Bragi's chief marketing officer, said "Bluetooth is a great thing" but acknowledged that the likes of Apple are working on alternatives. Chances are we will see this approach from the other companies in the hearables ring whether it's Sony's aim to add third party services to its Xperia Agent assistant or more practical connectivity and audio quality updates. For now, just a spare a thought for the poor souls designing, refining and making hearables over the holidays.